32 bars at a speed suitable for ranting. From Robert Messer: "The Huntsman's Chorus" (at least the A part) appears in "Der Jägerchor" in Carl Maria von Weber's opera "Der Freischütz". The score for this scene starts on page 169 here. There is stepping throughout the dance, rants or double steps (1-2-3-hop) in A, gallops in B1, and single steps (1-hop-2-hop) in B2. Peter's version has the top couple galloping down and back and down in B1 then standing still for the first half of B2. I have moved the second gallop down into B2 to give them more time and to reflect what probably happened in reality. Although Peter says eight couples of more, the Double Cast and Lead Up is not going to fit the music for that many couples unless you move very quickly. You can of course use as many couples as you like. 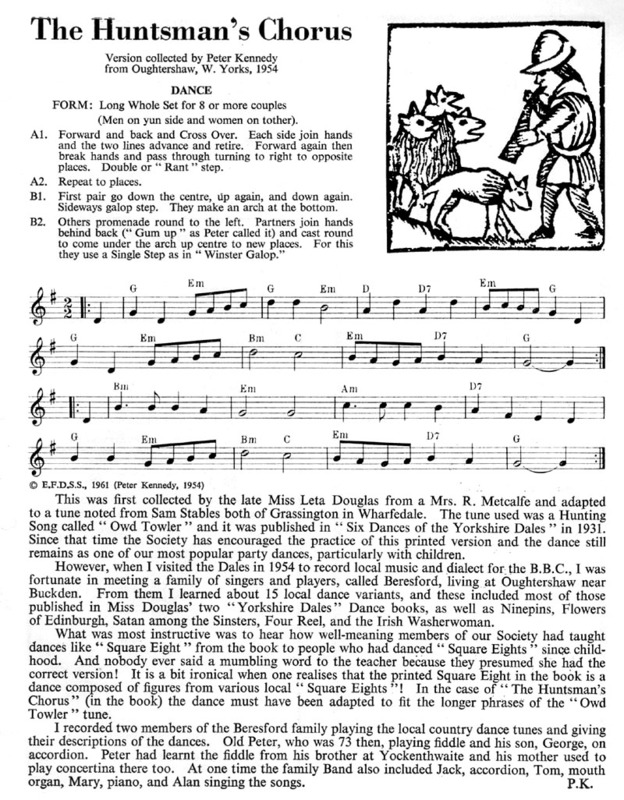 Originally published by Leta Douglas in "Six Dances of the Yorkshire Dales" (1931). There are many versions of this dance. An American one is shown here.